Looking for a local venue to hire, want to start a new activity, organise a fundraising event or thinking of volunteering? 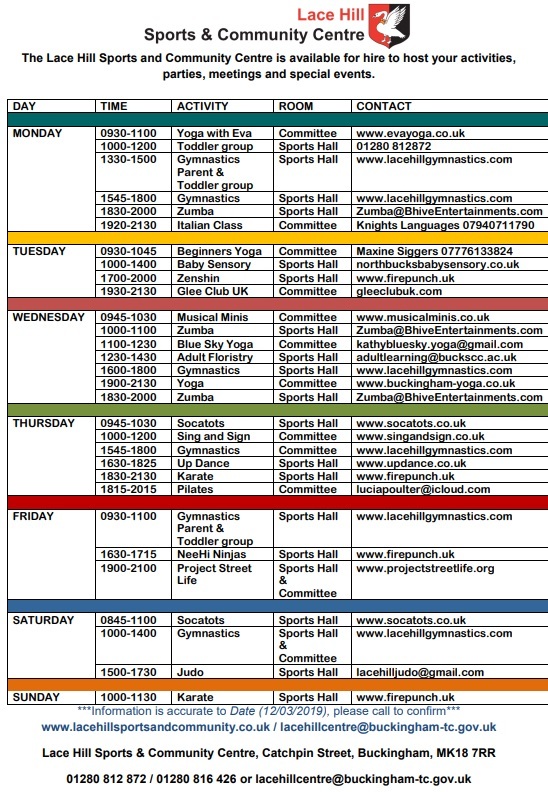 Then contact the Lace Hill Sports & Community Centre Co-ordinator today! 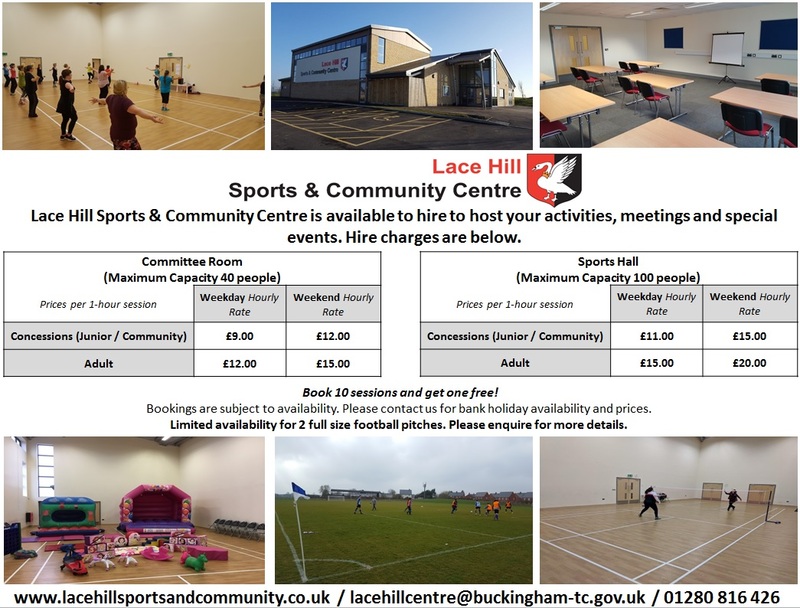 Lace Hill Sports & Community Centre is a welcoming facility situated on the new Lace Hill estate, owned and operated by Buckingham Town Council. 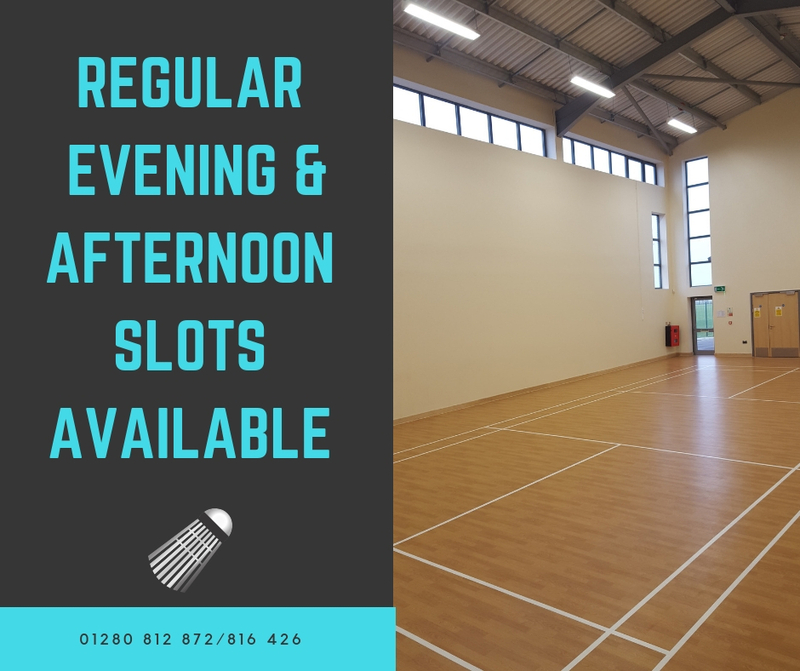 There are two main rooms, a Sports Hall and a Committee Room, that offer a range of activities from sports to exercise and private functions. 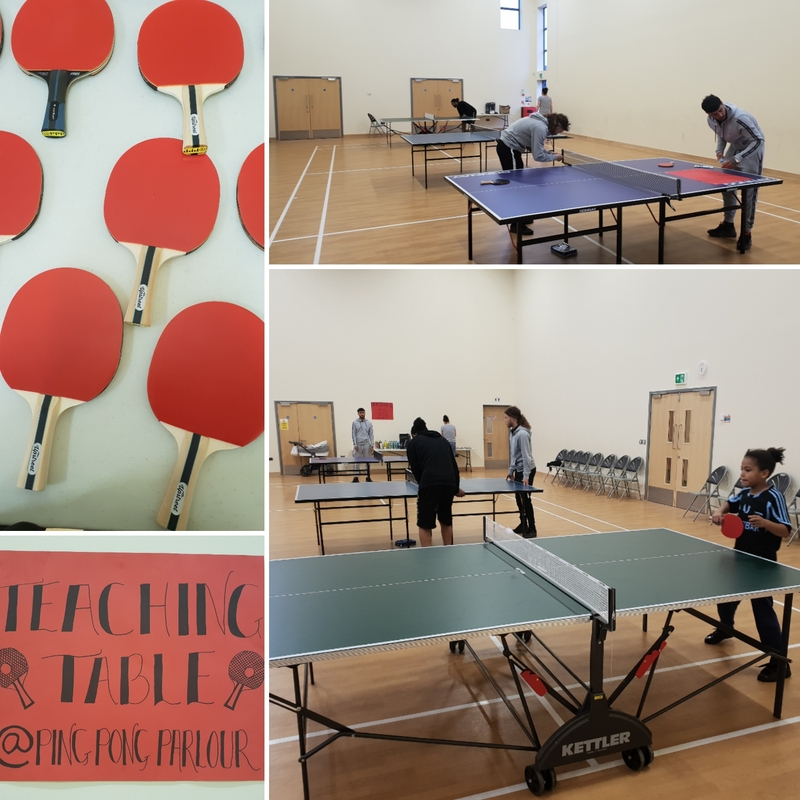 Lace Hill Sports & Community Centre aims to provide a well maintained, accessible community resource for the benefit of Buckingham residents, contributing to community growth, development, and the economic wellbeing of the local area. The facilities are normally available between 7am and 11pm. Bookings required outside of this time will be considered on an individual basis dependent on the proposed use. All hirers have use of a kitchen and male, female and accessible toilets. 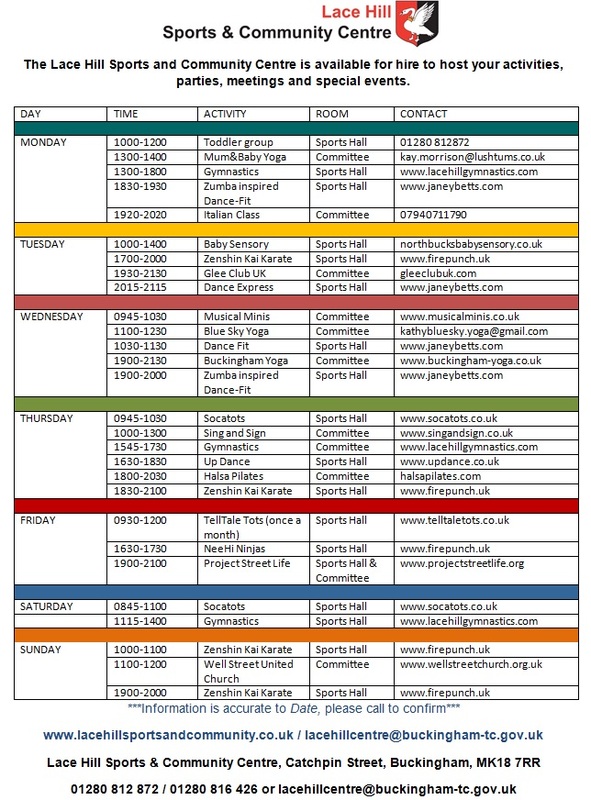 For more information about temporary event licences please contact Aylesbury Vale District Council’s licensing department or see information here. Come and play Table Tennis with Ping Pong Parlour. Adult session every Monday evening 8:30 pm – 10 pm £5. Family session every Saturday evening 6:30 pm – 8 pm, adults and children £3 (£2 for siblings). For further information and all enquiries please email: pingpongparlour1@gmail.com or phone 07826484813. Love to play Badminton? Private court hire available, just bring your own rackets and shuttlecocks. Booking is required. Our next community event is not one you want to miss! 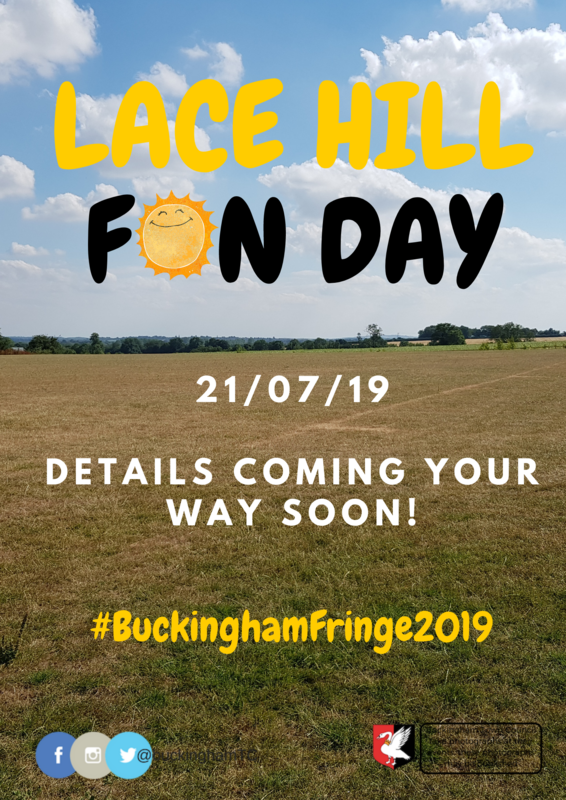 The Lace Hill Fun Day is a free event for the whole family to enjoy. Working in partnership with local businesses and organisations to bring you a free, fun filled day. This year we are celebrating the 50th anniversary of the first moon landing and we hope to show you a full on cosmic experience. Everyone is welcome! We need you! Do get in touch if you are a local business or organisation that would like to be part of the day, we would love to hear from you. Lace Hill Gymnastics Toddler Group – Mondays 1.30 pm – 3 pm and Fridays 9.30 am – 11 am, excluding bank holidays only. 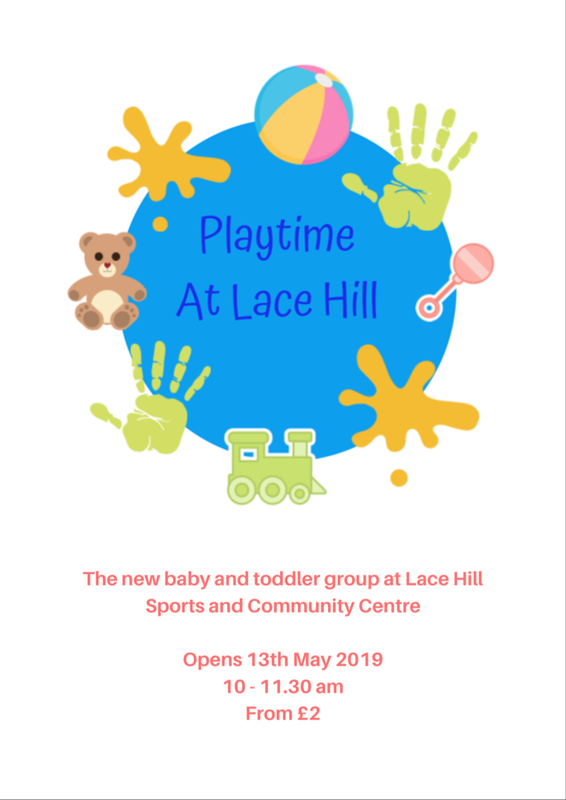 Play Time At Lace Hill – opens 13th May 2019, every Monday 10 am – 11.30 am, term time only. More information coming your way soon! Buckinghamshire Lace is a very fine pillow lace, and the making of it provided an income for local women until the First World War, especially here in Buckingham. Lace making is part of the Town’s industrial heritage. A typical Buckinghamshire Lace motif is the ‘cucumber’, a short fat oval with a line of holes (to represent seeds) inside; the Mayor’s jabot, a decorative collar, has a strip of cucumber pattern lace. Very complex patterns might need as many as a hundred bead-weighted bobbins and these were often carved and decorated. Town Councillors chose a mixture of names for the streets on Lace Hill– some tools, like Pillow, Bobbin, Linen, Silk, and some stitches, like Mayflower, Butterfly, Constance and Rosemary. 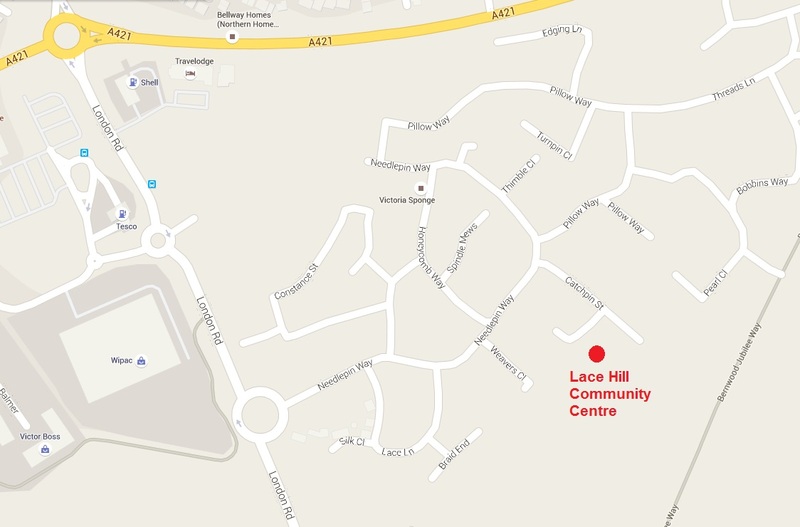 As for the name for the estate: Lace Hill is just for ease of reference. This does not need to form part of the postal address. The Town Council is grateful for the expert help of Kay Bradley, Kay Meadows and Helene Hill in compiling the list of possible street names. at: lacehillcentre@buckingham-tc.gov.uk or on 01280 812 872.